The 1989 Royal Rumble was the first Royal Rumble that I ever saw. It was such an exciting idea. 30 men enter at 2 minute intervals. The intrigue and mystery behind who was going to enter was palpable. 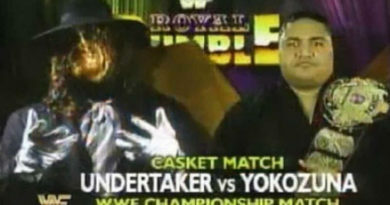 Before the main event there were several matches leading up to the Royal Rumble match itself. In between these matches, there were great vignettes with the bingo or lottery ball like number picker. There was a lot of speculation about the Million Dollar Man “buying” the number 30 spot. In one of the vignettes they show Demolition – Ax and Smash – come and draw their numbers. I remember them both commenting about how it was going to be a long night and the other member agreeing. Finally it was time for the main event. The Fink was in the ring announcing the rules of the match and how the winner would be decided. “Are you kidding me? It can’t be Demolition vs Demolition!” I had no clue what to expect. Ax and Smash are the tag team champions, they can’t possible fight each other. Boy was I wrong, as soon as Smash entered the ring the two of them locked up and began battling. During the first 2 minutes (before the third entrant) it was some classic Demolition stomping of the ring, only this time it was too each other. 10-9-8-7-6-5-4-3-2-1….buzzzzz. It’s Andre The Giant. Meanwhile, Ax and Smash are still battling in the ring. 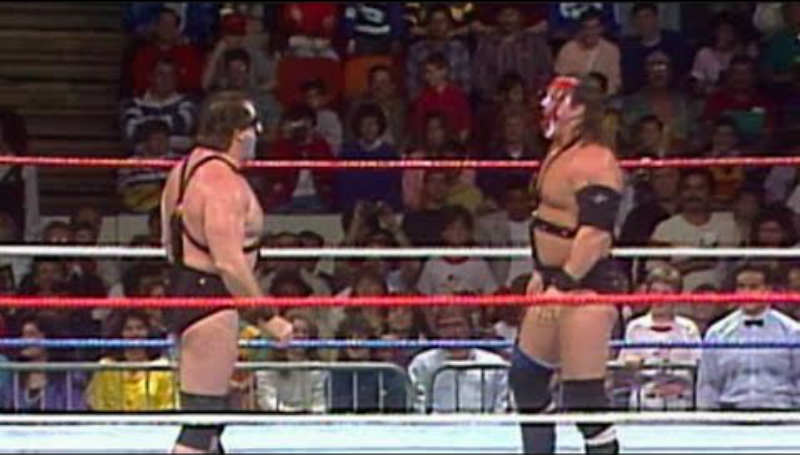 When Andre finally enters the ring, Ax and Smash have a quick word and begin to team up to eliminate The Giant. As the match progressed, there were a lot of close calls with wrestlers almost going over the top ropes with the added excitement every 2 minutes of a new superstar entering the match. As the match was nearing its end, the setup for Wrestlemania V was being put into place. It was the start to the breaking up of the Mega Powers when Hulk Hogan eliminated both the Macho Man and Bad News Brown at the same time. 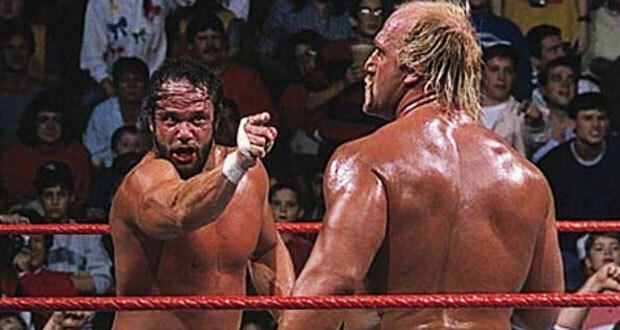 Hogan was eliminated shortly after by the Twin Towers, but not before getting some revenge – even though he had already been eliminated earlier – by pulling down the rope and eliminating the Big Boss Man. As expected, when the 30th man entered, it was indeed The Million Dollar Man giving him the best shot to win the Royal Rumble. 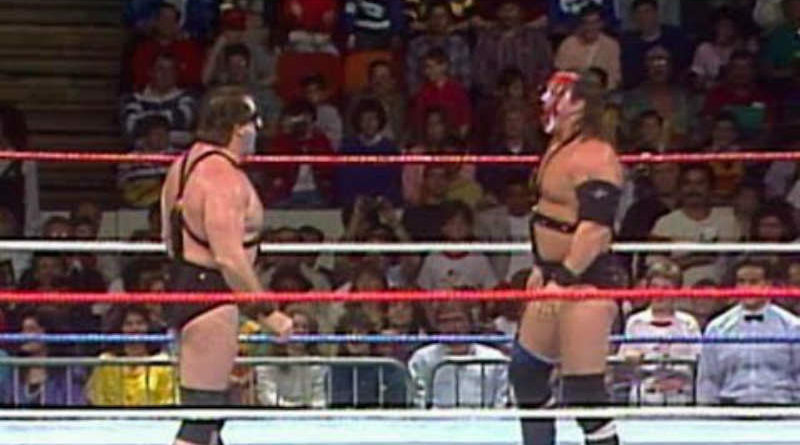 After watching the 1989 Royal Rumble, I was hooked on this being one of the great, unique matches that the WWF created.